Thread: KYC and AML checks. How did it begin? For years there have been requirements for necessary Know Your Client (KYC) and Anti Money Laundering (AML) procedures in place for financial services companies i.e. banks, stockbrokers, fund managers and insurance companies. In 1993 in Europe was accepted legislation in an attempt to combat “Money laundering” which was designed to prevent wrong doers from enjoying the proceeds of their nefarious activities. Following a G7 meeting, the Financial Action Task Force (FATF) published international standards to combat money laundering. After 9/11 terrorist attack, these were reviewed further. Thirty-four countries, between them representing the major financial centers around the world, signed up to these standards. In the USA, as a result of 9/11 and political pressure, KYC/AML legislation was strengthened to ensure once again that companies could prove that they knew who their clients actually were and how they had acquired their capital. However, such rules and regulations have not stopped organizations being fined — indeed the amount of money laundered by criminals is estimated to be as high as £100 billion a year. In the UK unlawful tax avoidance costs British taxpayers as much as £2.7 billion (€3.2 billion) in lost revenue, according to Transparency International. Initially it was proposed that Blockchain technology would enable one to be able to transact i.e. buy or sell with a stranger and maintain anonymity. Therefore many of the early Initial Coin Offerings (ICOs) did not bother with KYC or AML checks as organizations where able to typically receive Bitcoin or Ether and paid little regard to existing regulations. However, firms that carry out ICOs and have not carried out KYC and AML checks are finding it difficult to even open a bank account now. In late 2017 even the exchanges that trade Cryptocurrencies insist that their clients have to be verified i.e. 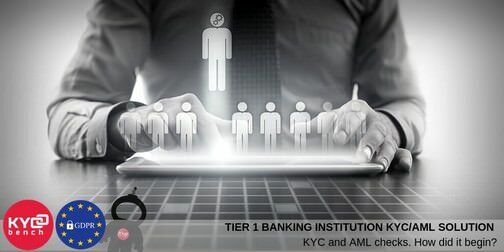 had KYC/AML checks carried out. Failure to comply is likely to mean that you can no longer use an exchange and in the short term the amount of capital that you are able to with draw is being significantly reduced to encourage clients to comply, like Poloniex and other exchanges, which announced that they will be asking all their clients to be verified. Meanwhile, mobile technology which is already in most consumers’ hands, like smartphones, means that the cameras they have in their pockets are now so high-spec that they can be used to scan documents and take photographs of the user. Selfie’ photographs can even be combined with verified passport data to confirm that the individual using the mobile device corresponds to the identity document presented, like in KYCBench. This approach has many benefits beyond what being readily available. It allows KYC to be tightly integrated into existing digital marketing and communication channels, rather insisting consumers send copies of original utility bills to their service providers. It removes the costs and errors associated with manual processes. By using advanced machine learning techniques, accuracy can be greatly improved and the risk of fraud (and therefore fines) dramatically reduced. KYCBench, GDPR and ICO27001 complaint platform, is aiming to help both consumers and organizations to do business faster and more efficiently in complainant manner as it is replacing manual paper checks with digital authorization.